A team of British scientists may have rediscovered the centre of one of Africa's greatest kingdoms - and the possible burial place of the legendary Queen of Sheba. Dr Patrick Darling: "The locals believe the legend - and that's what's important"Hidden in the Nigerian rainforest, the earthworks at Eredo are just a few hour's drive from Lagos. The team from Bournemouth University, working with archaeologist Dr Patrick Darling, have completed a preliminary survey of the wall and ditch measuring 70ft high in places and around 100 miles long. While not approaching the complexity of a project like the pyramids in Egypt, the builders would have shifted an estimated 3.5 million cubic metres of earth during construction of the ramparts. This is one million cubic metres more than the amount of rock and earth used in the Great Pyramid at Giza. The wall marks out what the believed boundary of the original Ijebu kingdom, ruled by the 'Awujale' spiritual leader. Civil wars and the arrival of the British eventually broke the kingdom's centuries-old Lagos lagoon trade monopoly. 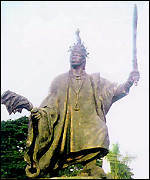 But the Awujale of the modern day town of Ijebu-Ode still holds a traditional position of responsibility. Dr Darling, described the Eredo site as a breathtaking find with many of its remains relatively intact, though overgrown by the rainforest. The Awujale: Link to Sheba? "We are not linking what we found to a city, but to a vast kingdom boundary rampart," he told the BBC. 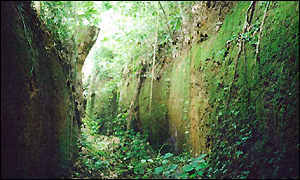 "The vertical sided ditches go around the area for 100 miles and it is more than 1,000 years old. "That makes it the earliest proof of an kingdom founded in the African rainforest." 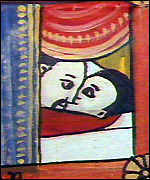 But more intriguing still is the suggested link to the Queen of Sheba, one of the world's oldest love stories. According to the Old Testament, the Queen, ruler of Saba, sent a camel train of gold and ivory to King Solomon. Solomon wooed and married the queen after she became overwhelmed by the splendour of his palace and their son began a dynasty of rulers in Ethiopia. The Bible dates the queen's reign to the tenth century BC and modern scholars have speculated that a link between Judea and an ancient African queen led to the emergence of Judaism in Ethiopia. In a tale closely linked to that in the Bible, the Koran describes the Queen as a sun worshipper based in the Arabian peninsula who was converted to Islam. Arabian legend names the queen "Bilqis" and links her to the incense trade which was then a source of great regional power. Lovers: Figures of legend...But 500-year-old Portuguese documents hint at the power of an Ijebu kingdom and build the case for Sheba being on the other side of the continent. Local people near to the Eredo monuments link the area to Bilikisu Sungbo, another name for Sheba, said Dr Darling. Local tradition speaks of a great queen building a vast monument of remembrance and there is an annual pilgrimage to what is believed to be her grave. The region's long history of gold and ivory trade and the cultural importance of eunuchs linked to royal households further support the Sheba link. ... and Hollywood film"I don't want to overplay the Sheba theory, but it cannot be discounted," said Dr Darling. "The local people believe it and that's what is important. "Hundreds or thousands of pilgrims come to this area every year to honour what could be her grave, a magical shrine grove under tall trees. "She's very much a real figure to local people. She is associated with the earlier figure of Bilikiso Sungbo, but I think the traditional figure was a powerful matriarch. "The most cogent argument against it at the moment is the dating." 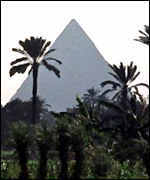 The Pyramids: Could Nigeria find rival the great wonder?Dr Darling, a member of the African Legacy educational organisation which is working with the Nigerian Government, said that Eredo could become Nigeria's first world heritage site, joining monuments like Stonehenge in the UK and the pyramids of Egypt. He said Eredo had remained hidden to the outside world because of the lack of scientific and archaeological research in west Africa. "What is exciting about this for me is that we are beginning to bring out the tremendous political and cultural achievements of black Africa," he said. "But there is a lot more work that we can do in the region."